The 10 Best Ice Skating Rinks in New Jersey! Get your legs and heart rate going this winter at one of New Jersey’s many excellent ice skating rinks. It’s great for family time, group events, dates, and birthday parties. Don’t know how to skate or haven’t gone in a long time? Many locations offer group lessons or private lessons for learners of all ages and skill levels. Skate rentals are also available for locations that offer public skate hours. 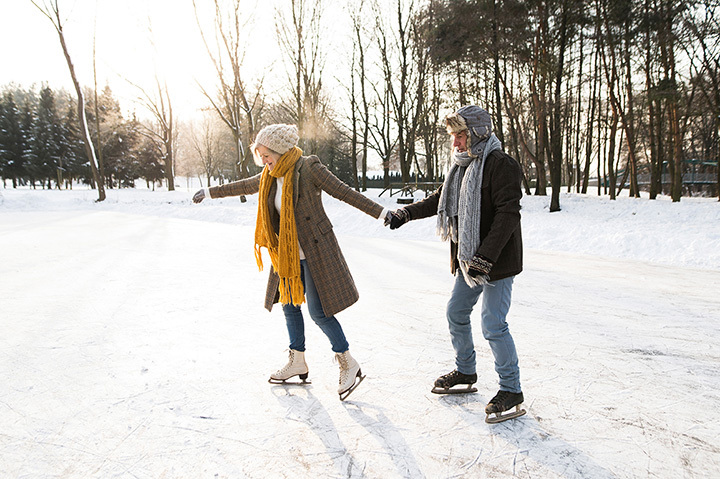 Whether you’re looking for a quick loop around the rink or a regular hobby, ice skating is a fun activity for everyone. Here are the 10 best ice skating rinks in the Garden State. The Union Sports Arena provides public skating hours each day of the week and offers events to groups and families. Their café also offers food, hot beverages, and Wi-Fi when skaters need a break to rest and refuel. Hockey leagues and skating lessons are also available. This local favorite hosts several high school hockey teams and also has public skating hours. They are currently undergoing renovations to provide better facilities in the future including more space and a year-round sports center. There will also be a new concession and video game area. This Middlesex County skating location provides outdoor skating with large open space for families and groups. It is part of the larger Roosevelt Park grounds and offers group skating lessons. Full rink rentals and skate rentals are available. This skating arena is a part of the larger sports complex that also offers laser tag and an arcade. Public skating hours vary from day to day and skates can be rented. Adults can also join a hockey league for fun. This large facility provides three rinks allowing for plenty of space to skate. Hockey and figure skating sessions are available but there are also public sessions on the weekends from Friday evening to Sunday. A pro shop and snack bar are also onsite. Clary provides a rink, party area, and concession stand. This no-frills arena provides lessons for all ages from “Mommy & Me” classes to adults. Rink rentals are available for parties or special group activities. Check their website for seasonal offers. This new, modern indoor center offers open skate sessions, group skating lessons, and various hockey clinics or leagues. Beginners can take lessons in hockey for basic skills or train in figure skating with official teachers. They also have a full cafe and pro shop to take a break or buy equipment. Opened in 2003, this rink provides sessions for public skating, stick and puck, and freestyle skating. They provide many programs for both group and individual lessons. Birthday party and group event rentals are also available. The Arenas are a bonus skating site with ice skating and roller skating housed under one roof. Lessons are available for both types of skating. This place has special offers and party packages available on their website. The full-service café and Skyline Pavilion are both available for events. Skylands offers the full range of skating with hockey lessons, hockey clinics, skating lessons, event rentals, youth nights, and more. Their rink is a full-sized NHL rink used by their own team, the Skyland Kings. A full snack bar and Tim Horton’s coffee shop are on location as well. View more New Jersey Ice Skating Rinks.